Continuing along the "Golden RIng" of ancient ccities, another 40 miles or so north of Rostov, is the very beautiful city of Yaroslaavl. Founded almost 1,000 years ago by Yaroslav the Wise along the picturesque banks of the mighty Volga River, at its confluence with the smaller Kotorosl River, Yaroslavl is an absolute treasure chest for art-lovers — a dream world for lovers of old Russian architecture and icons, and a lovely sacred site. A wealthy commercial city, Yaroslavl reached its zenith in the 17th and 18th centuries, as a result of taking full advantage of its location on the Volga for lucrative trade. 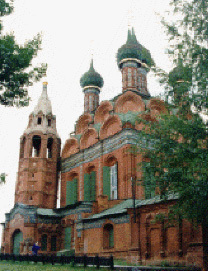 Many of the beautiful churches are still largely intact, because after Yaroslavl lost its pre-eminence, no one bothered to destroy it, since it was in an out-of-the-way location. 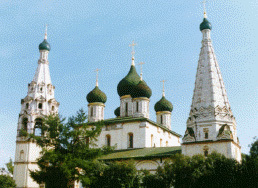 While in Yaroslavl, one may feast at a banquet of churches and monasteries, built in an elaborate and distinctively Yaroslavl style, that abound with magnificent ornamental brick and glazed ceramic tile decorations (photo, above left), and whose equally elaborate interior fresco icons are unusually well preserved. 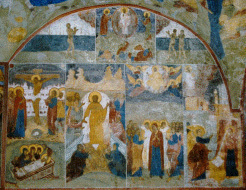 The frescoes cover every inch of the interior walls, ceilings and pillars, such as in the Church of St. Elias/Elijah (photo, above center), whose extremely awesome fresco icons are very extensive. Located adjacent to a large open square, the exterior of this Church of St. Elias/Elijah (photo, above right) is just as beautiful as the interior. Sometimes a quartet from the Yaroslavl Male Chorus, who sing at this church for Divine Services, is present, eager to sing for visitors if requested, (and to sell their wonderful recordings of sacred music). Another one of the extremely beautiful churches in Yaroslavl, located almost next to the main hotel, is the Church of the Theophany (photo to the right), with its gorgeous glazed ceramic tile decorations all around it. 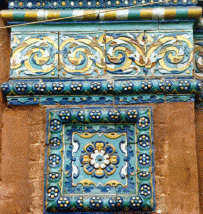 The example shown above is a detail from this church's facade. Among Yaroslavl's magnificent treasures is a fine museum of icons. In addition to driving to sites on a city tour, it is also pleasant to take time to walk along the Volga River and the city's squares and look closely at some of the many spectacular churches that are located fairly close together, within walking distance from the hotel. 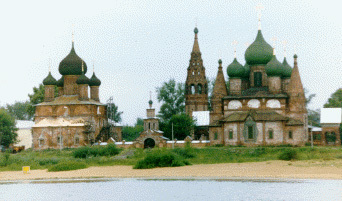 It is also delightful to take a boat ride on the Volga to get a perspective from the river of some of the magnificent structures, which include the Women's Monastery of the Tolga Icon of the Mother of God, where the relics of St. Ignatius Brianchaninov are located, and the ensemble across the Kotorosl River in Khorovnikakh — the Churches of St. John Chrysostom (right) and Vladimirskaya (left), in the photo at the top.